New York City screams hustle. Every day, people come to the concrete jungle in hopes of opportunity, of the chance to showcase their abilities and better themselves. 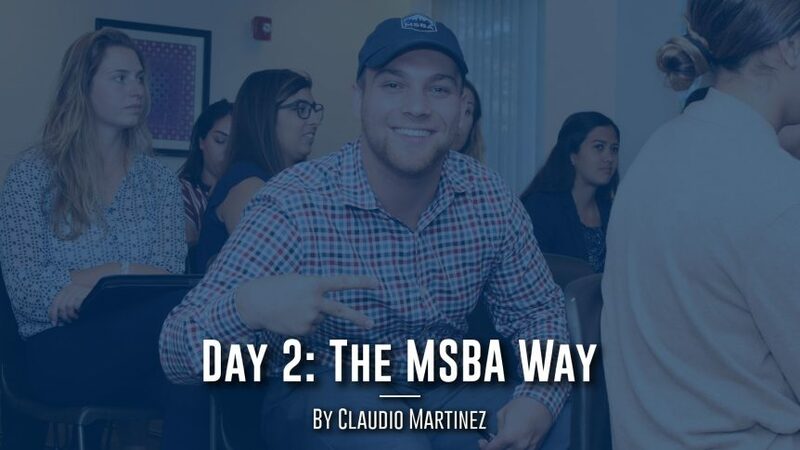 In this way and many others, the MSBA program directly reflects the city it was born in, and this was apparent from Day Two when our MSBA 2018 class sat down for our first programming event. Sitting side by side in the library of our housing complex, there was a feeling of nervous excitement that permeated the space. Fresh off many of our first days of work, my classmates and I eagerly awaited to hear from our first Speaker of the summer, David Oestreicher, MSBA’s Co-Founder. As I sat amongst my classmates, a number of thoughts swam through my head, but chief among them was the need to seize the day. One thing I’ve learned in my short time in New York is that opportunity waits around every corner. Every day is new, and nothing is what you expect, so all you can do is to try to soak it all in. With this in mind, I’ve continually wanted to maximize my MSBA experience in every way possible, and admittedly that personal challenge can be somewhat daunting. When you are presented with the opportunity of a lifetime like MSBA, all you want to do is perform to the best of your ability. For me, that has meant being the first in the office for my internship at Radegen Sports Management, and the last out. I want to be nonstop, doing anything and everything to soak up as much knowledge as possible and maximize my networking opportunities. This has begged the question, “how do I make this all happen the right way?” When you strive to make the most of an opportunity, the last thing you want to do is slip up or miss out on the one event, task, or connection that could be a significant game changer for the summer. These were the thoughts present in my head when David walked out in front of us, and I was searching for answers. He spoke with a commanding presence, like the captain of a ship before our crew as we headed out for the journey that this summer has become. David introduced himself and gave us his background, with a resume and career as impressive as any other I have heard to date. He then proceeded to introduce us to the MSBA Way. The MSBA Way, as David explained to our class, is a way of carrying ourselves that reflects both our unique talents as individuals and the six years of MSBA classes that came before us. David expanded on this idea, explaining that the MSBA Way is based on showing how much you care, having a passion for learning, and controlling what you can control. This idea of controlling what you can control particularly struck a chord with me. I’ve always gone through life with the frame of mind that I go all in on whatever is in front of me; I leave it all on the field. When David spoke of controlling what I can control, the idea of chasing down every single opportunity with the same intensity, but at the same time refining my efforts so that I “set myself up for luck,” was music to my ears. I became determined to take control of my summer one step at a time, worrying less about what was outside my sphere of influence and more about what was in front of me; applying not only my passion for the industry, but also using a refined process of preparation to conquer challenges and reach my goals. Being proactive, being persistent, and controlling how you are viewed are all elements of the tried and true MSBA approach. As a participant and member of this class, I’m incredibly thankful to be here, and learning about the MSBA Way has brought a newfound sense of excitement and quiet confidence to my life. I can’t wait for the hustle and the memories that this summer is going to bring. As David pointed out to our class, a lot of “blood, sweat, and tears” have gone into making this program what it is today, and I’m sure my classmates and I will make the same contributions. That being said, no matter what paths my classmates and I decide to go down, I know that after Day Two we can all operate with the assuredness that comes with living life the MSBA Way.